I love truck food. I love tacos. I love food trucks right by my office that serve up super-special vegetarian-friendly tacos. The sudden surge of young, college-grads starting food trucks to realize their culinary dreams (and work their butts off) has recently brought Honest Tom’s tacos, Hubbub Coffee, and now Coup de Taco. Their website commands “Welcome to the Taco Revolution. Savor the Conquest. Join the Revolution.” They park on 40th between Locust and Spruce. 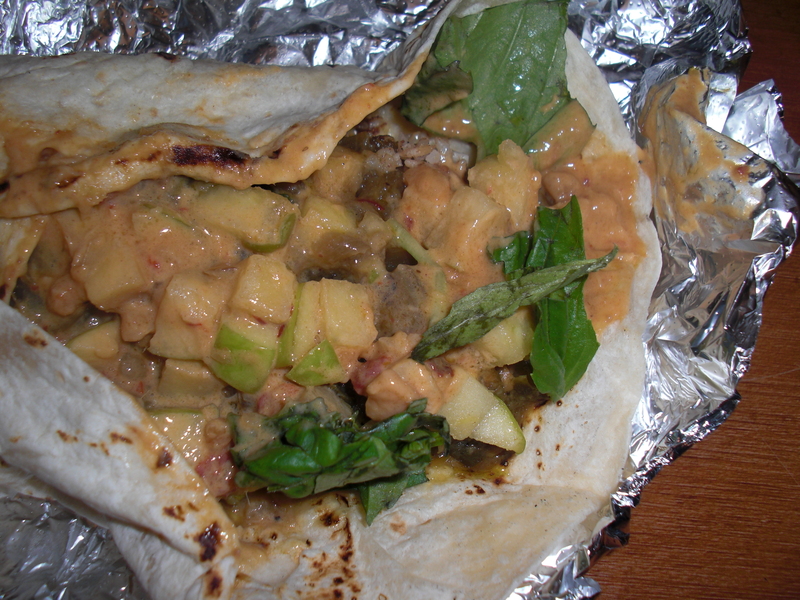 The special love in Coup de Taco is their seriously vegetarian menu. Every item number comes with a veggie counterpart – seitan, edamame hummus, “riblets” and portabello mushrooms. 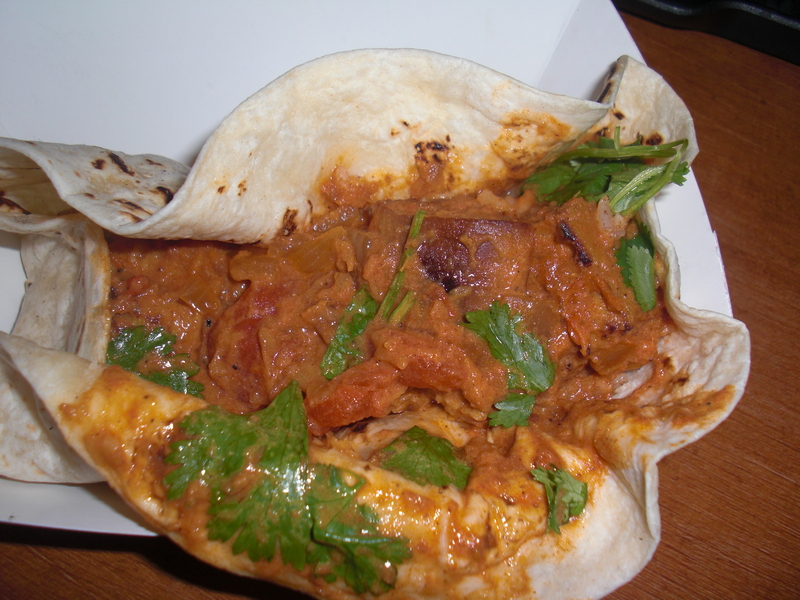 Pictured above is the Indian Tika Masala taco with grilled seitan, tikka tomato sauce, coconut rice and cilantro. Wrapped in a flour taco (or served in a rice bowl, an option for all tacos) the only think that would make this taco tastier is if the sietan were shredded (like pulled pork) so that it could soak up more of the delicious sauce. Sweet Thai Coconut Tacos with Portabello Mushrooms, however, I wasn’t so sure about. Perhaps it because I over-ordered (these tacos are deceptively filling), but more than that, I think it was the citrus marinated green apples on top of the peanut sauce. I tend not to feel excited about sweet with my savory, and would have really liked to toss the apples, but in a slaw of some sort, and add more mushrooms. Overall, the truck is a super concept, offering fast, homemade, tasty food at affordable prices. $3.50 for one taco, $5 for two, and $8 for three. Grab a side of baked chips with roasted edamame hummos and a glass of ginger green tea and you’re good to go. 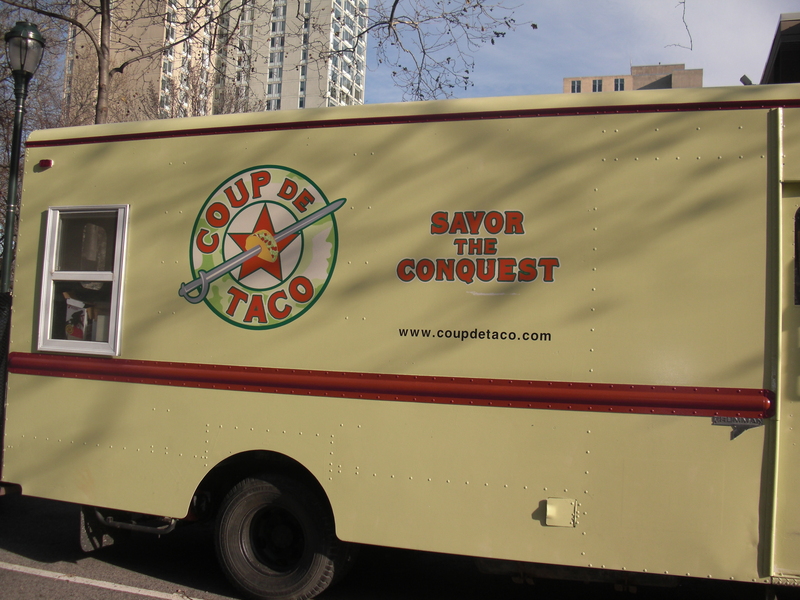 I’ve still got more tacos to try (the caprese, a southern bbq, and whatever else they dream up) the only thing that would make me happier right now with the Coup de Taco truck guys (and their sweet smiles) is a brown rice and tortilla option. This taco truck is great. I think it has to work a few kinks out, since it is new to the campus. I really enjoyed the chicken version of the Thai tacos. I too would appreciate whole wheat tortilla options and brown rice.